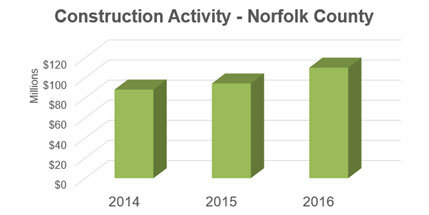 Norfolk County’s development community contributed to a record investment in new construction in 2016, with total project values reaching almost $110 million. Significant increases in construction occurred in the institutional, agricultural, industrial and residential sectors. Residential construction was the major contributor to the total, with more than $68 million in single-family dwellings, up 11% from the year before. With $15.8 million in multi-residential starts, condos and apartments accounted for the second largest share of construction spending, with the Dover Wharf accounting for $8 million in that sector. Multi-residential starts decreased nine per cent compared to the year previous. A total of 389 new dwelling units were created in Norfolk County in 2016. Residential starts have been strong for the last two years. Agricultural construction activity was also very strong. More than $11 million worth of farm-related buildings and expansions were started last year, up 59% from 2015. Large projects include two $1.2-million solar installations by Port Dover Farms, two dairy barn projects costing $850,000 and $573,000, and a greenhouse development worth $585,000. Commercial and industrial construction values accounted for about $8 million in total activity in 2016. Commercial construction was down, compared to the year previous, but industrial expansions increased dramatically. The Port Ryerse wind farm accounted for $3 million in industrial construction value, although the developer, Boralex, describes the project as a $38-million investment. Toyotetsu’s auto parts plant filed expansion plans worth more than $2-million with Norfolk County’s Building Division. Institutional construction values increased to $5.1 million in 2016, up threefold compared to the year previous. Large projects in this category included the Delhi Health Centre at $1.6 million and the library addition in Delhi at $1.2 million. Planners, Economic Development and Building staff are now co-located on the second floor of the Robinson Administration Building at 185 Robinson Street in downtown Simcoe, providing an excellent one-stop customer service area for developers, builders and investors. Norfolk County has an Official Plan and a consolidated Zoning By-Law that simplify the land-use planning process across the entire municipality. The Development & Cultural Service Department has also implemented the successful Development Action Team (a one-window approach to applications), a pre-consultation process (to identify challenges and opportunities as quickly as possible), Developer Information Sessions (to inform and gather feedback from the development community) and Team Norfolk (a group of community influencers who act as a barometer to initiatives in our community and spread the word about developing in Norfolk County).